Pure Stock Auto Restoration Inc.
Like the Indian tribe from which it took its name, the Firebird Comanche was destined to be as pure as the wisest chief, as fierce as the strongest warrior, and as swift as the fastest brave. But have you ever heard of one? If not, don't feel alone. We hadn't either (or seen one) until an Expresso Brown Firebird 400 convertible with Comanche emblems and unique, chromed hood and fender inserts arrived at the Ames Performance Tri-Power Pontiac Nationals in August 2008. It was such a head-turner that Tom DeMauro, HPP's editor, chose it for his Editor's Choice Award. It didn't take long before we had located its owner, Steve Johns, a 50-year-old sales-territory manager with Syngenta Crop Protection in Seaforth in Ontario, Canada. "I found this Firebird Comanche sitting at a small garage near my hometown," he tells HPP. "It was there for some service work and not for sale at the time. When I first saw it, I was very intrigued by its Comanche emblems; I had never heard of the name on a Firebird before." Just as Pontiac owners in the U.S. contact Jim Mattison of PHS Automotive Services (www.phs-online.com) to find their cars' build histories, Steve contacted George Zapora of GM Canada and learned that his Pontiac was one of an estimated 87 Firebird convertibles (and four Trans Am convertibles) produced with the L74 400 H.O./RA-III engine and a manual transmission. No information on the Comanche limited-edition existed at GM Canada, however. Researching further, Steve contacted Early Birds, a Firebird restoration-parts supplier in Toronto. It was familiar with the Firebird Comanches and had parted out a '69 400/335hp automatic Comanche coupe many years before. It also knew the location of a second surviving example, a convertible, and passed the data on to Steve. "I went to see this other Comanche, and it was virtually identical to the one I had found, with the exception of the drivetrain, which, like the parted-out car, was also a 400/335hp automatic" he says. "Its owner had an original Comanche sales brochure," Steve continues. "It told me what I had not known: The Firebird Comanche was 'An American GT with Special American Virtues,' and was sold exclusively at three Canadian Pontiac dealers only, in Montreal, Toronto, and Ottawa." Going back to the first Comanche he had found, Steve was ready to make a deal, but it still wasn't for sale. "I've owned a '73 Firebird Formula 400 since I was a teenager, but I've always loved the idea of someday owning a '69 Firebird convertible four-speed car. It took me months of negotiations, but finally, in August 1994, I purchased it." Steve decided to learn as much as he could about the Comanche Firebirds. One of the most informative pieces he found was a two-page article, "Road Impressions," in Track & Traffic (Mar. '69). "Through it, I learned that Grant Hamilton was the president of a Montreal dealership, which bore his name. He was an avid racer and liked what Carroll Shelby was doing for the Mustang. He wanted to do something similar for Pontiac, and that's why he created the Firebird Comanche," he says. According to Steve's research, Hamilton ordered his Firebirds highly optioned from the factory. All had 400ci V-8s, leather/Morrokide seats, variable-ratio power steering, power disc brakes, power trunk release, power top (if convertible) or Cordova top (if coupe), tilt wheel, console, Rally gauges, radio, door-edge guards, vanity mirrors, remote-control driver-side outside rearview mirror, deluxe custom seatbelts, Rally IIs, floor mats, Instant-Aire pump, heavy-duty air cleaner, and a heavy-duty radiator. To convert each of these special-ordered, specific-optioned Firebirds into a Comanche took approximately one week. Grant Hamilton Pontiac's bodyshop painted the tail panel off-white, which the staff dubbed the "Kamm tail," and added white stripes coming out of the front fender louvers. Other dealer modifications included a "twin-snorkel" air cleaner, high-speed driving lights, Marchal 653 foglamps, hoodpins, chromed hood inserts, chrome-diecast Comanche emblems, front/rear Koni shocks, special suspension (specs unknown), and Pirelli Cinturato radial tires. In the interior, they added a Sun SuperTach 8,000-rpm tachometer, which the techs mounted below the dash. Comparing his Comanche against both the one detailed in the vintage article and the one he had seen in person, Steve determined that his rare Firebird was more than just a documented member of this new tribe of grand touring, limited-edition F-bodies. His was optioned with all the qualities one should attribute to the tribe's chief, as evidenced by its L74 400 H.O./RA-III engine, M21 close-ratio four-speed transmission, 3.90 Safe-T-Track, power driver seat, power windows, and AM/FM radio. "Whether my Comanche was built as the ultimate dealer-showroom display or was special-ordered for a wealthy customer is unknown, but you'd be hard-pressed to find any options on the sales-order form that were left out," he says. Subsequent research put Steve in contact with Chris Wilkin, the nephew of Grant Hamilton, who was a salesman at Grant Hamilton Pontiac and personally sold Comanche Firebirds when new. "Grant participated in many types of automotive challenges, such as rallies, circuit racing, and gymkhanas . . . [he] was instrumental in introducing the '64 Tri-Power GTO to the Montreal market. In 1967, he purchased the building of Parkway Pontiac on the outskirts of Montreal [which he renamed Grant Hamilton Pontiac]. The Comanche was solely [his] brainchild. [It] was conceived as a vehicle to differentiate Grant Hamilton Pontiac from other General Motors dealerships. He had an entente [a diplomatic understanding] with General Motors that it would not produce any like automobiles for other dealerships. Grant passed away at an early age in June 1991." Restoration "This Comanche was in very good condition for its age," Steve recalls. "Its undercarriage had been undercoated when new, which resulted in the frame and floors being clean, at least by Canadian standards. The body had been repainted in the late '80s, in its original color, and it was in nice condition, too, however, the white Kamm tail and fender stripes had not been reapplied to the car. Its original interior was complete, but worn and in need of replacement. The engine bay's appearance had been neglected, however everything was largely intact, with no rust issues. Even the original two-piece brake rotors and ball joints were still in place." Steve asked his brother, Richard Johns, owner/operator of Pure Stock Auto Restorations (www.purestockauto.com) in Mount Brydges, Ontario, to execute the restoration. "The Comanche's paintwork was still very presentable, so Steve and I decided to only redo what needed to be done to make the car a nice showy driver, without blowing the car completely apart," he says. That constituted a minimal amount of metal work. "Three floorpan sections and the lower trunk pan were replaced due to water damage," according to Richard, followed by repainting the top surfaces-the Comanche hood, Endura nose, front valance, filler panel, upper rear quarters, decklid, and rear tail panel. "I scuffed the paint, and then applied two coats of Dupont ChromaBase in Expresso Brown, followed by four coats of Dupont 7900S ChromaClear. Then I wet-sanded the entire car, starting with Norton 1,000-grit and progressed to 2,500-grit, followed by buffing using 3M products. Afterwards, I masked off the areas and painted the off-white Kamm tail and front-fender stripes, again with Dupont products," he says. "The '69 Comanche that Early Birds had put me in touch with still had its original two-tone paint, so through detailed photographs, we were able to correctly document the exact locations of the fender stripes and Kamm tail color for my car," Steve adds. Engine bay, undercarriage, and mechanical restoration followed. Richard pulled the entire drivetrain, including the rear axle and rear leaf springs, media-blasted the engine bay, subframe, and undercarriage; then taped them off and applied PPG DP90 Epoxy primer. He bored the code-WQ 400 0.030 over and installed a ready-to-rock rotating assembly, consisting of a Pontiac crankshaft (turned 0.010/0.010), Ross pistons, stock polished-beam rods, and a Mellings "744" stock-replacement camshaft with 301/313 degrees duration and 0.413/0.413-inch lift. Date-coded No. 48 heads received Ferrea 2.11/1.77 stainless steel valves, new valvesprings, stock-replacement pushrods, and stock-replacement 1.5:1 stamped-steel rockers. The rebuilt engine was mated to its original long-branch exhaust manifolds, which, after reinstallation in the car, route the spent gases through a 2.5-inch mandrel-bent Pypes stainless-steel exhaust system, including X-style crossover and 14-inch Race Pro mufflers. A Crane XRI electronic ignition and high-intensity coil send spark through date-coded Packard wires to ACDelco 43TS plugs. The original M21 gets its shifts from a rebuilt Hurst Competition Plus shifter and its smooth engagement from a Centerforce 11-inch Dual-Friction clutch. Power is transferred rearward to the original 3.90-geared GM 8.2-inch ZK-code nodular rearend with a new Auburn posi. Fuel and brake systems were restored to stock specs. The bumpers, 400 hoodscoop inserts, and original Comanche emblems were rechromed by Midway Plating, in London, Ontario. Richard removed the stainless-steel bright trim pieces, straightened and buffed them using a Brador buffing wheel, and reinstalled them. In addition, he completely disassembled the convertible-top mechanism, repainted it with PPG DP90 epoxy primer, and reinstalled it with a reproduction convertible top and an original-style plastic window. Then Richard removed the original interior, stripped it to bare metal and primed and painted the dash and steering column, matching the color from the inside of the original glovebox door. He shot two coats of Dupont Satin Clear and installed a replacement dashpad, dash bezels, carpet, rear-door panels, and restored gauge pods and front door panels. "The seats were the most difficult part because of the rare factory leather/Morrokide seat covers, which are not currently reproduced," Richard says. "I located a matching hide through C.C. Leathers in Toronto, Ontario; then Dixie Auto Trim of London cut leather pieces from the cowhide to exactly match the original leather panels. The material allowed me to redo the top leather surfaces of the seatcovers, while PUI Gold Mustard vinyl yardage was used for the seat bottoms, sides, and piping." 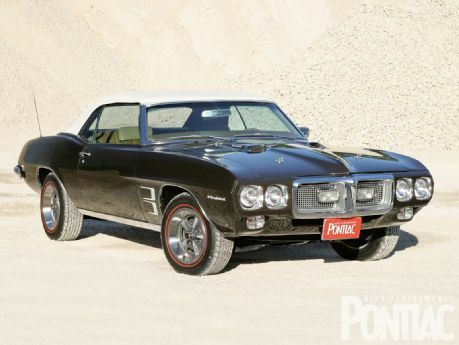 According to Jacques Duval, writer of the article in Track and Traffic, 13 '68 Firebird Comanches were produced and a '69 Firebird Comanche limited-edition was in production at the time of the story. (A '69 Firebird Comanche appears in the sales brochure and in advertisements.) Steve has located two '68 Comanches-one coupe and one convertible-and three '69 Comanches in addition to his-one coupe, one convertible, plus the coupe that Early Birds parted out. His estimate (and we stress that it is his estimate only) is that less than 50 Firebird Comanches were produced in total over the two model years. It appears that no records exist documenting exactly how many Firebird Comanches were made for 1969, however. In addition, there are no records of any Firebird Comanches being made off of a Second-Generation Firebird for the '70 model year. All indications are that the Comanche was a two-year production only. "The Firebird Comanche is truly a unique car," Steve says. "Mine is the only example with a 400 H.O./RA-III that I've located so far, and it's doubtful many more Comanches, base 400 or H.O./RA-IIIs, survived the years. I feel honored to have added to the story of this cool piece of Pontiac history." Steve Johns has started a registry of Firebird Comanches and their owners. He can be contacted at sjohns@tcc.on.ca. Getting onto the road with the Comanche was a very pleasing experience to say the least, and it was here that the car's true G.T. qualities were brought to the fore. Contrary to many hairy, rough-running and finicky engines, the Comanche's [engine] was quiet and idled smoothly. Its flexibility and power were outstanding; standing starts could be made quite smoothly in Third gear without difficulty, although naturally this practice is not recommended. From a standing start, we reached 60 mph in 7 seconds and in 12 seconds more we were at 100 mph, with 30 mph more to go to reach top speed. Even at 130 mph, our test car tracked arrow-straight and felt very stable. With engine rpm at 5,500, the noise level at this speed was quite low. At cruising speeds, the firmer suspension, combined with the radial-ply tires, made themselves felt, and a certain amount of harshness was transmitted to the driver and passenger, especially from the rear wheels. Its cornering manners were really impeccable and one can think of very few cars indeed that can compare. In tighter corners, a very slight understeer became neutral as speed went upward. When thrown into a corner, at what seemed like an unreasonable speed, the Comanche took it all in its stride-no protest, no loss of control, and a pure pleasure to the sporting driver. Driving it in the rain was a real joy too, and we even had the [Pirelli] Cinturatos screeching in the wet. Clutch pedal pressure, as well as steering effort, were both very low; low enough, in fact, to make it pleasurable for the woman driver; and this is something that can't be said for the average car of this type. The same can be said for the smooth-shifting transmission, although we did encounter a little difficulty getting into reverse at times. Steering action was excellent and as quick (21/2 turns lock-to-lock) as one could wish for to make this G.T. a pleasure to drive. The brakes did their work very well and produced a little fade only when used very hard from top speed. Brake and throttle pedals were placed so that a heel-and-toe technique for downshifting was possible, although the pedals could be set up a little better in relation to each other. In summing up we can say that the Firebird Comanche gave us a great deal of pleasure to drive, and we feel that it could make converts of a lot of sporting enthusiasts who might not otherwise buy an American car. Grant Hamilton has created a G.T. car in the true sense, and for this he deserves our respect and admiration.